That would be a very crazy coincidence! Welcome! Hi! My name is Jenna, I'm 18.5 weeks along with our first (surprise, birth control defying) baby! My Fiancé and I have been together for three years and are getting married on October 22nd this year, four months post baby! I could not be more excited; I've known since I was little that I was meant to be a mother. This has been the best surprise I could ask for. EDD is June 28th 2017, 20 week gender ultrasound is scheduled for Feb. 9th (our anniversary and my 23rd birthday!) and I absolutely cannot wait to find out what we're having. Honestly I just want people to share my excitement with, because everyday I think about how I just cant wait to meet him/her! @jromell congratulations on the wedding and baby!!! My anatomy scan is on the 9th as well, we found out through NIPT that we are having a girl, hopefully the anatomy scan confirms that because the nursery is already painted... lol! Welcome to the group! @BellaO21 thats great! When is your due date? I've been patiently (impatiently) awaiting the day we find out and it seems like its taken FOREVER to get this close! @jromell I'm 20+2 now, due on 6/17... having a later scan since my Dr is out of town. This is all new to me. 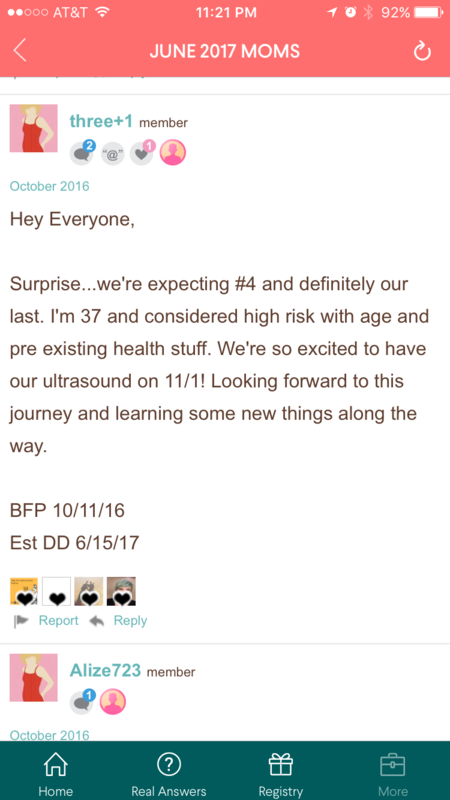 First time mom-to-be, and surprise at my age - 44! My partner and I are in a new relationship so we're taking this all one day at a time, but couldn't be more thrilled! Got some scary news of low amnio fluid at week 19 - hoping and praying for the best. Hi ladies! Just found this group on Bump so sorry for the late intro. I'm a FTM, due June 13th with a boy. Married, live in southern California and can't wait to join a bump group! Hi! I'm Ken and this is my first pregnancy and I am so overwhelmed. I'm 18 and giving my baby girl up for adoption (open, to super nice people who have been trying for ten years for a baby I can't even imagine) She's due June 12th and I'm already so excited to meet her I can't stand it. Uhhm what else... I like drawing and painting and when I'm in the right mood embroidery. Also I'm trans so he/him pronouns for me. Also also I've been lurking for a while and y'all use so many abbreviations it takes me forever to decode like jeez someone please explain?? While they are not all explained there, some are explained within past threads and others if you don't know - just ask! Too many to list them all out. Hi everyone this is my fourth i have a 17, 15 year old and than a 11 month old! My due date is june 17. We are having a boy! This little guy came as a surprise as we were done having kids! Some days are a struggle with an 11 month old and working full time! I had my tubes tied only to find out i was pregnant when they did the procedure! I'm a little late posting... my June bug is due on the 1st. Was a bit of a surprise, was told I couldn't have anymore kids. My one and only (until now) just turned 19. So, a little time in between. But everyone is super excited to welcome my little man. Hi ladies! I'm a late joiner. I was a bumpie with my May 2013 boy and I don't know why I didn't come back till now! It's so helpful to have others that are going through the same things you're going through!!! I got my BFP in late October and our little girl will join us on June 26th (or earlier I hope). This pregnancy has been a lot harder than my 1st but mostly because my son was a friggin sailboat! Happy and healthy pregnancies to all of you!!! Here's hoping the last 3 months fly by! My cousin just had a little girl last month and named her Evangeline Hope! I haven't ever heard the name before so it made me double take when I saw you say that's what you're naming your LO! Hello! I'm joining the party way late.. I am a FTM and didn't even realize that these birth month clubs were a thing. I'm expecting a little man due on June 9th! I've always been a worrier and this pregnancy has definitely been a lot harder than I thought it would be, both physically and mentally but reading through some of the past posts it helps to see other moms going through the same things as me. Glad I'm joining now! I thought I had already posted here but I am not finding it. My EDD is June 26th but it is normal for me to go past the EDD so it is totally possible that I will have a July baby's. This will be #4 for us and we have 3 girls, 5, 3, and 18mo. We are Team Green for the 4th time. I love that hubby gets to announce the gender when our babies are born. Hey so this friggin app likes to log me out randomly and my Prego brain couldn't remember the log in. Well I found it or so I thought. Turns out what I found was my log in way back from when I was in December 2014. Which I couldn't find last October when I got my BFP. So I did an intro last October with the new log in information I created and I'll post a pic of it. Anyhow as this log in says my name is Jenn. I'm really now the mommy to 4 little loves. Due 6/15 though it looks like I'll be induced on 6/16. So I've been on the board as two separate log ins. Sorry to make it confusing. Hello! Just wanted to introduce myself! Long time lurker between May and June boards (mainly Bc I am a mobile bumper and it's temperamental). Hubby and I are turning 30 in August. This is our first (Rainbow) baby, Malania Rose, she was due 5/27 and was born 6/6. I am ebf and a Sahm. Even though she is our first, I was a professional nanny for 6 years, so sometimes I have useless knowledge! Hello June ladies, I'm from the July board but as it turns out my baby will be a June baby, I'm having a c-section next Friday June 30th because baby is breech. I've been lurking this board for the past few months, because I honestly never really thought I would make it to full term. I've been through three losses; an early miscarriage, late miscarriage at 17 weeks and premature labor at 22 weeks. I am currently 37.2 weeks and team pink!! It's been a hard couple of years but I'm finally getting my rainbow. Happy to be joining this board as well! Hello June Mama's! Thanks for letting us from July jump in! DD is due 7/22. DS was an Oct15 baby. My first pregnancy included lots of nausea, but this one has been much easier. I have started watching your board closely the last few weeks and enjoyed seeing your babies start to make their appearances. Congratulations June Mama's! I'm so sorry to hear of your losses. I've had two, but I can't imagine the pain of a premature labor and loss. Congrats on your rainbow! @shmarpler thank you so much, it definitively takes a toll on you no matter how far along you are but you have to get up again. You never forget but you learn to live through the pain and find a new normal I guess. Hi! I'm jumping in from May, I noticed you didn't get many replies in that thread, but there's only like 3 of us who still post on the board, so that's probably why. Anyway, DS2 was born on 5/19. DS1 was 3 in January. And it's been so long since I've intro'd anywhere I don't remember what I should include... anyway. Hi! Hello, another may mom here. DS2 was born may 19th and I have another DS who is almost 2. Another May mom, although DD was born premature on 3/3. I have two older boys, 5 and 3. @Mkrosieo @fiorip @PartiallyDomesticated @lrwardrop @mcvgal Welcome ladies! Thanks for livening things up! Hey guys! I mostly post in July, but I've been straddling the whole time with my due date - it was just easier to all be new together once July opened! I'm not sure if I ever did an intro post here though. My OB has never changed my official EDD of 7/3, but it was 6/30 by my count. Anyway, that only really matters now because baby boy is breech and they would only schedule my c-section for my official 39th week, which starts today! My c-section will be Thursday, provided he doesn't decide to flip in the meantime. I'm 35, a first time mom, I live in NY, and I'm best known for my rainbow colored hair and photobombing cutest dog ever! Hello! Another May mama crossing over. DS was born early on 4/18 via csection. I also have a toddler who turned 2 in May. Congrats to all the June mamas and good luck to the Julys! I have a May baby and we were invited to come over and say hello to you all. Congratulations on your new or imminent babies! My DD2 was born 5/18, though due 5/11. Don't believe the myth that 2nd and 3rd babies come earlier and earlier because they may be later and later, as was the case with me. We have two other kids, DS age 6.5 and DD1 age 3.5. Things are going well and DD is growing fast. The older kids are in love, as are we. Hi! I'm Sara! I live in LA and I'm a FTM of Carrie who will be 4mo on 10/26! First time I've participated in a forum, so looking forward to becoming part of this community!